Memorial Drive is a great Boston sunrise photography spot. I often head over to the Cambridge site of the Charles River to capture the Back Bay skyline at twilight when its famous landmarks are illuminated by the night light. However, in the wee hours of the day, Boston looks different. The morning show started minutes before sunrise when the sky turned deep orange and continued after the sun hit the horizon. 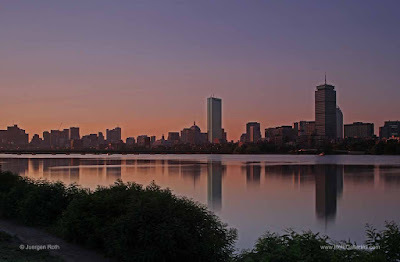 I equipped my camera with a neutral density to lengthen the exposure time and create a milky water effect in the Charles River and an additional split ND filter to balance the harsh contrast between dark foreground and bright sky and captured multiple images of the sunrise light along the Charles River Skyline. A tripod is always an essential photo gear in long exposure photography and I choose a wide angle lens to capture some of scrubs in the foreground and the hues of the sky in the Charles River. During routine post processing I removed unwanted dust spots, adjusted lighting, contrast and color saturation before sharpening the final Boston skyline photography image Hello Boston in Photoshop.